The economy is running hot. So why is Morneau still stepping on the gas? Still, Morneau's update signals a dramatic shift in this government's focus a year out from an election. Instead of continuing with tax cuts and programs such as the Canada Child Benefit targeted directly at middle class taxpayers, Morneau is reaching out to a business community that has been wary of the Liberals' deficit financing, unhappy with its changes to small business tax rates and worried that the Trump's reforms would make them less competitive. 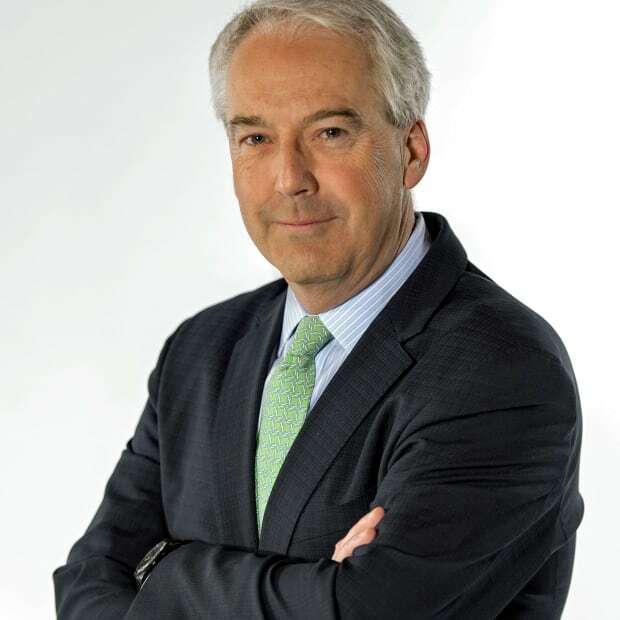 "We're deficit-financing the corporate sector," said Kevin Page, the former parliamentary budget officer who now heads the Centre for Fiscal Studies and Democracy at the University of Ottawa. "This is a financial statement that responds to the business community." Just look at the numbers. Of the $17.6 billion in new measures over six years announced in the update, $14.4 billion goes to the tax changes for business. Throw in a few other measures for innovation and helping industries expand into overseas markets and the sum earmarked for businesses rises to $16.5 billion. 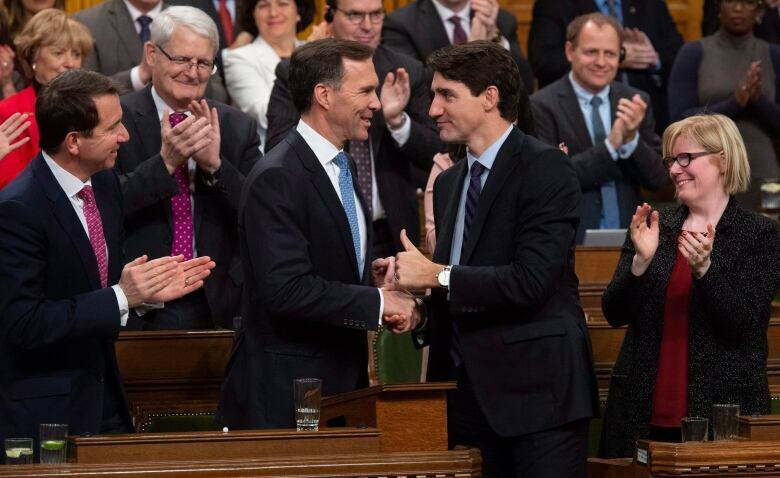 The rest of the new spending — $1.1 billion — goes to tax credits for local journalism, a social finance fund and implementing pay equity in federally-regulated workplaces. Morneau's plan is not without risks. The price for Canadian oil is well below world prices. Interest rates are expected to rise at some point. Page notes that the fastest growing federal expenditure this year and next will be the cost of servicing the existing debt. And yet there's no date to return to budget balance. There's no indication that, despite the buoyant Canadian economy, the Liberals feel any need to start winding down stimulus. Conservatives spent much of the lead-up to Wednesday's economic update demanding to know when the budget would be balanced. 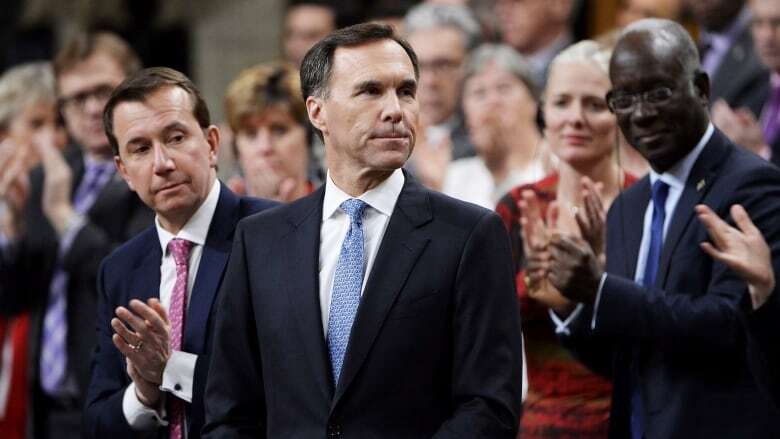 Pierre Poilievre, the party's finance critic, said Morneau's plan added "almost a million to our national debt" in the half hour it took to deliver his speech. "And we know Canadians will get the bill." New Democrats, meanwhile, would have spent the money being directed to corporations on providing (for example) a national pharmacare plan. The Liberals can still do that. There's another budget between now and when Canadians go to the polls. More money that can be spent if — and this is a big if — the economy continues its strong performance. But for now, the Liberals are content with helping Canadian businesses. The hope is that it will lead to more economic growth, and more jobs. If it doesn't, it will be an expensive write-off for the Liberals … just as they're about to ask taxpayers for another four years in office.